Cannes is officially under way and like last year, I'll be compiling reviews of the films screened each day. So in lieu of being there you can get the buzz of the what's hot and what's not as it happens. Robin Hood chronicles the life of an expert archer, previously interested only in self-preservation, from his service in King Richard I’s army against the French. Todd McCarthy (IndieWire - Deep Focus) says it's "neither as good as the director’s personal best period epic, “Gladiator,” nor a match for Hollywood’s most memorable previous accounts of the beneficent bandit of Sherwood Forest (it is, however, superior to the Kevin Costner entry two decades back". McCarthy cites a disconnection between Scott's very serious style with the romping nature of the Robin Hood story, "the dramatic sobreity and historical consciousness with which the director approaches this new take is knee-capped by the sort of broadstroke villainy and motivational simplicity more suitable for a straightforward audience pleaser of yore." Xan Brooks (Guardian UK) finds it "a lengthy, bombastic origins tale in which Robin (Crowe) spends more time battling the Frenchies on the beach than robbing the rich in the forest – a film, perhaps, for the Cameron era?"..." For all its flash and thunder, the film winds up signifying very little." Tim Robey (Telegraph UK) is a tad more lenient, "Nothing here is as entertaining as the swordfight up the steps in Michael Curtiz’s famous 1938 film, or Alan Rickman’s withering Sheriff of Nottingham – certainly not Matthew Macfadyen’s token take on the same character. What saves the movie, which is quite flawed but still Scott’s best in nearly a decade, is its majestic feel for the English landscape." Jimmy O from JoBlo.com, writes, "(Ridley Scott) has created something of a misstep that sometimes borders on terrific yet mostly meanders in and out of just okay in Sherwood Forest...As uneven and sometimes frustrating as I found this, there are certainly moments of power. 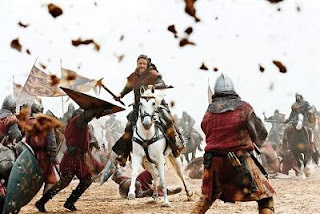 Most of the bloody battles at least look good, even if you feel like you’ve seen it before."